This book is about credit cards. Credit cards aren’t the most interesting things. We don’t like to think much about our expenses after all. Lunch can cost people from $5USD to $15USD per day. Then, there’s rent, tuition, public transportation, interests if I take out a loan or miss a credit card bill, medical bills, insurance, and — in the case of many international students including myself — the exchange rate to worry about. If you aren’t restricted by visas, you can alleviate some of the pain with part-time jobs — which have their own costs and benefits to calculate into. We are living through these troubles daily and there’s no need to remind us about that. Fiction (and art in general) can be seen as a way to escape. It is relaxing to walk around the charming city of Neo-Venezia in Aria or exciting to find yourself fighting against demons from various mythologies in Shin Megami Tensei: Nocturne. Nothing about it is realistic and that’s why it is exciting. But there is also an artistic tradition that denies such leisure. The realist goal is to make art depict life in every shade possible. They untangle the complexities of society through novels about family life or a short story collection about people’s everyday routines. This sentiment to imitate life in art will appear and disappear throughout the years, but when it does appear something can make a big scene and make you realize that even your credit card bills can get quite interesting. 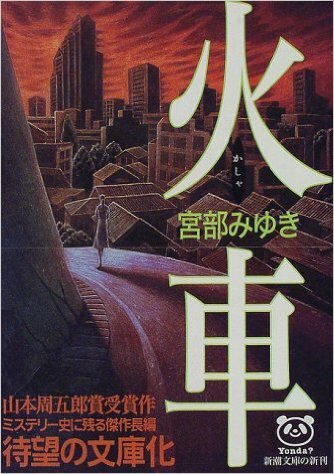 Enter 火車, a 新本格ミステリー (shinhonkaku mystery — I talk about this movement in the Danganronpa post on Tanoshimi.xyz). Honma Shunsuke is a police detective injured in the line of duty who decides to take a job investigating the disappearance of a woman, Sekine Shouko, who is engaged to marry his nephew-in-law. Honma, at first, takes this case out of respect for his nephew-in-law, but his curiosity naturally rises as he learns more and more about her. From the beginning, Miyabe Miyuki’s third person narration slowly immerses the reader into her depiction of the day-to-day world of Japan. Descriptions of the people in the train, the stairs Honma takes in the station, the people he passes by on the street never seem to stop. Tokyo is crowded, Osaka is dreary, and neighborhoods are becoming empty. Honma goes into seedy districts and hostess bars for Shouko’s whereabouts. Then, he will find himself asking the boss of an IT company for her resume. A lawyer of Shouko keeps reminding him about how reckless people can go when it comes to achieving their dreams. All Honma could grab are scraps of data from these ventures: credit card bills, anecdotes, empty apartments, small pieces of paper with jottings, and faded photographs are the only clues he has. What do these credit card bills and anecdotes tell about a person? For starters, they show the buying habits of a person and enforce some hypotheses about the personality. Little by little, they piece up together to form the identity of Sekine Shouko. She is a tidy woman who needs little household appliances in her small apartment. She goes on the train to find different jobs. She may have turned left on that corner, then crossed the street before climbing up the very same stairs Honma has just climbed. She is close. That is because Sekine Shouko is no femme fatale. She is any one of us. She wants a life full of excitement and free of troubles. She is an ordinary woman who has dreamed too far. She is exhausted by the mundane activities of life. She is any one of us who is still dreaming of a future. All she wants in her life is a spouse, a house, and a happy life. But for many people, those kinds of dreams and hopes die in the alleys they have to pass through every day. People aren’t thinking of becoming the next great novelist or living in bungalow in a tropical island but on how to pay the bills so they can have electricity for the next day. Everyone wants to live another day. Shouko refuses to give up those dreams however. Her credit card bills skyrocket as she indulges more and more. Her madness arises from her struggle to find some meaning in her life. Shouldn’t we praise her for her efforts? For her individualism in a collectivist society? For her going against the narrative that she has to be an ordinary woman? No, our instincts tell us she is in the wrong because she has fought against the law. Looking for happiness could very well be her crime. There are hints, though never extrapolated by Miyabe’s narration, that suggest why Honma becomes so emotionally invested in the crime. He wants to see Shouko in the flesh because she reminds him of his wife. They may be different people, but both are women who have loved and wanted happiness. It’s hard for the reader to not be as invested as Honma too. In its most engaging moments, 火車 turns the usually drab process of interviews to a meditation on human nature and capitalism. The invisible hand isn’t just helping entrepreneurs benefit from one another’s selfishness but guiding consumers to misleading advertisement campaigns. These dialogs let us understand why people like Shouko can trip up and fall into bankruptcy without ever being able to recover. It is telling that Miyabe has cited various law and economic textbooks on the back of 火車 as well. In fact, it is the research that never stops flowing in each page which impresses me. Each city Honma visits feels like it is written there and not from a photograph. It almost reads like a historical fiction book thanks to how fleshed out the settings are. From the smallest of trivia to the tiniest of details, nothing about it feels fake and the writer has carefully observed there are no mistakes in her writing. The novel also goes out of the way to be so realistic that when Honda Tomatsu, a childhood friend of Shouko, suggests that there might be a possibility in faking alibis the police detective characters laugh. No real police investigation will allow such a blunder and she has simply read way too many detective novels. It may be easier to critique the book not just as contemporary work of Japanese literature but on the same aesthetic system as historical fiction; it is unlike most crime fiction books I have read. But how much is too much research? Historical fiction writers can get overbearing with their data and forget they are writing a story. Miyabe doesn’t go that far because she still remembers there is a story — Shouko’s identity — that hover over the narrative like an apparition. However, she does get carried away when detailing everything there is to know about bankruptcy laws. In one particular scene, the dialog resembles a Wikipedia article chopped into a script format. Fatigue creeps in and that is not a good sign for a book that is almost six hundred pages long. I find myself having difficulty concentrating when I reached the last quarter or so. The book has worn out its welcome long ago and I can’t help but wonder if this book would have benefited if the book was cut into half. By the time I have reached the ending, some few plot threads are left loose and I am extremely exhausted by the book. But the ending is, while predictable, cathartic and it ends as it should — with a bow on the stage before leaving left stage. 火車 is a journey worth undertaking despite my complaints. In our search for who Shouko is, the book is more of an investigation of who we really are under the pressure of capitalism and material desires. Our identities may be more than a collection of credit card bills, past jobs, and people who we once loved, but there is little beyond that. We are all dreamers whose collective sin is to find happiness someday. There is an English translation of this book by Alfred Birnbaum (Murakami Haruki’s A Wild Sheep Chase) titled All She Was Worth. I have a feeling it is abridged judging from how low the page count is (296 pages) and Birnbaum’s translations are, from what I remember, not very good. Still, for the non-Japanese readers for this blog, this may be worth looking into. Your articles on books are as enthralling as ever! This was a good read, makes me want to find the english translation tho it sounds like it might be a shoddy one? A friend and me did some theorizing and we believe the story has been rewritten to a typical murder mystery. Such is the case of translations.